Clergy Confidential: In Good Faith: "C'mon Get Happy"
In Good Faith: "C'mon Get Happy"
In my latest "In Good Faith" column I explore the possibilities of leaving it all behind to go on tour with the family. Sure, there are a few obstacles standing in the way like adequate talent and the lack of a Partridge Family-style bus. But surely those aren't insurmountable? 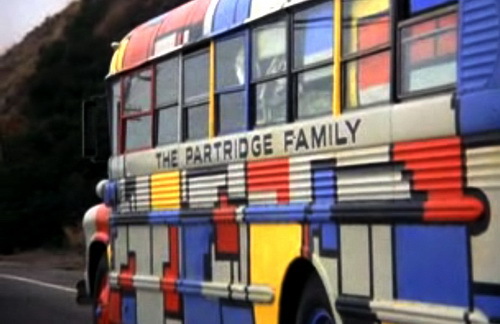 “Don’t look now but we’re becoming the Partridge Family,” I muttered to my wife the other day. No, we didn’t trade in our ten-year-old mini-van for a vintage tour bus but over the summer the boys and I started taking music lessons. Although it’s been 25 years since my last one, I’m officially a guitar student again. Now that my dream of playing major league baseball has been unceremoniously jettisoned – evidently no team wants to sign a 40-something with little talent and less experience – all I have left is my dream to become a rock n’ roll star. Over the summer the boys and I discovered the newly opened Guitar Center in Braintree. Occupying the former Borders space, the place is a cavernous candy store for would-be rockers. Despite the name, the place is packed with not only guitars but drums, keyboards, amps, basses, and anything else you could possibly need to imitate the Rolling Stones. Or Danny Bonaduce. Best of all, they offer on-site lessons. So after drooling over various instruments, the next thing I knew the three of us were signed up to start rocking out. The real musician in our family is Zack who has played the clarinet and recently graduated to the oboe (if you get confused among woodwinds, it’s the duck in Peter and the Wolf). The instrument is so obscure he’s evidently the only oboe player in the entire Hingham Middle School. During summer camp he became enamored with the bass guitar and has been plucking away ever since. Well, ever since I put out the call on Facebook to ask if anyone local had a bass guitar burning a hole in their basement. Someone did. Ben tooled around on the violin in elementary school before dropping it like a bad transmission when he had the chance. So naturally he’s our drummer. I always swore no child of mine would ever play the drums. Of course this is coming from the same father who swore that no child of his would ever become a Yankees fan. A few lessons and a starter drum kit off Craig’s List later, our house sounds like a combat zone heavy on the artillery. Actually, I’m a big fan of the blues and have hacked around with basic blues riffs for years. Every once in a while, when it’s been that kind of day, I’ll plug in the old Fender Stratocaster that sits in my office closet and crank up the amp after everyone’s left. There’s just something about the blues for me that connects with the soul and relieves stress. Now that I’m actually taking lessons again, with a phenomenal teacher/guitar hero named Matt Sullivan, I’m learning new things every week and some of them even stick. There’s something about tapping into your latent creative side that is wonderfully enriching. I find it’s especially easy for adults to lose their creative edge amid the demands of simply getting through the day. Like everything else in life – including prayer – it takes intentionality to carve out time for creativity. It’s not about the talent – fortunately – it’s about finding things that nurture the soul and allow us to use the gifts and passions bestowed upon us by God. I’m trying both metaphorically and literally to plug into this but pursuing your creativity may well be unplugged – like art or writing or cooking or gardening or woodworking. At some point I’ll obviously be leaving my day job to hit the road and start touring. Aside from getting Bryna a tambourine, the only other thing we’ll need is a tour bus. The priest in Mad Men played the guitar. Just saying. No worries though. He hasn't appeared since season before last. Played by Colin Hanks. the bishop who lives at St Jeromes over the bridge plays the guitar-he's really good. Perhaps an interfaith band? Best line: "It's the duck in Peter and the Wolf," generated a delighted smile from me.